HAYS, Kan. – As they follow Fort Hays State University athletic teams around the country, it’s not unusual for Ryan Prickett and Gerard Wellbrock to run into former co-workers who are FHSU graduates like themselves. Prickett, sports information director at FHSU, and Wellbrock, radio voice of the Tigers, hit the jackpot this week. The duo is in Sioux Falls, S.D., covering the Tiger women’s basketball team in the NCAA Division II Central Regional. FHSU’s first-round opponent Friday was Southwestern Oklahoma State University, which had not just one or two, but three Tiger alumni representing the Bulldogs in the tournament. Sporting the navy and white of SWOSU as the two teams were scheduled to meet in the noon contest were Doug Self, the Bulldogs’ SID; Lacey Jones, a graduate assistant in the athletic training program in charge of working with the women’s basketball team; and Mike Hammett, radio voice of the Bulldogs. All three worked under Prickett during their college careers at Fort Hays State. Hammett then focused on broadcasting and worked for three years at Eagle Radio in Hays, where he learned under Wellbrock. The group met for dinner Thursday night in Sioux Falls, and Prickett and Wellbrock weren’t outnumbered. Accompanying Wellbrock, sports director for Eagle Radio, was Dustin Armbruster, another FHSU grad. Armbruster is KJLS program director at Eagle. He does play-by-play for Hays High School athletics and provides color commentary for Tiger broadcasts. “I keep in touch with a lot of my former students who worked in our department at Fort Hays State, but it’s always nice to get together with them in person,” said Prickett, a two-time graduate of FHSU (2003 and ’05) who is in his 13th year as the Tigers’ head SID. While the six alums knew they would be working for different schools Friday, there is a mutual respect among them. Jones said the variety of experience she received at FHSU has been invaluable as she pursues her master’s degree in athletic training from SWOSU. Jones, who will graduate with her master’s degree in May, said she has been looking forward to today’s game and still follows the Tigers on the radio. Others who have worked under Wellbrock and Prickett share the same high opinion of them. “Ryan is one of the hardest working guys out there, and I soon found out how well respected he is in his field,” said Self, who graduated with a bachelor’s degree in 2010, then earned a master’s in sports administration in 2012. Armbruster, who grew up in WaKeeney and graduated from FHSU in 2004, had similar praise for Wellbrock. Hammett, a 2008 Fort Hays State graduate, agreed. It’s all about conducting yourself with professionalism every step of the way, said Wellbrock, who learned from one of the best. Wellbrock grew up listening to former Tiger broadcaster Bob Davis, who went on to become the Voice of the University of Kansas Jayhawks. Like Armbruster, Wellbrock – who grew up in Victoria – stayed close to home to go to college and graduated from FHSU in 1990. He has been at Eagle Radio since 1992, working his way up to Voice of the Tigers in 2002. While their younger counterparts were busy giving Prickett and Wellbrock credit for teaching by example, they said it goes both ways. Wellbrock and Armbruster, along with Prickett, have more fun ahead in Sioux City after Fort Hays State pulled out a thrilling, 78-75 victory over SWOSU Friday. With the win, the Tigers (26-6) advanced to Saturday's semifinals vs. the winner of Friday's game between Central Missouri State University and Minnesota State University-Moorhead. 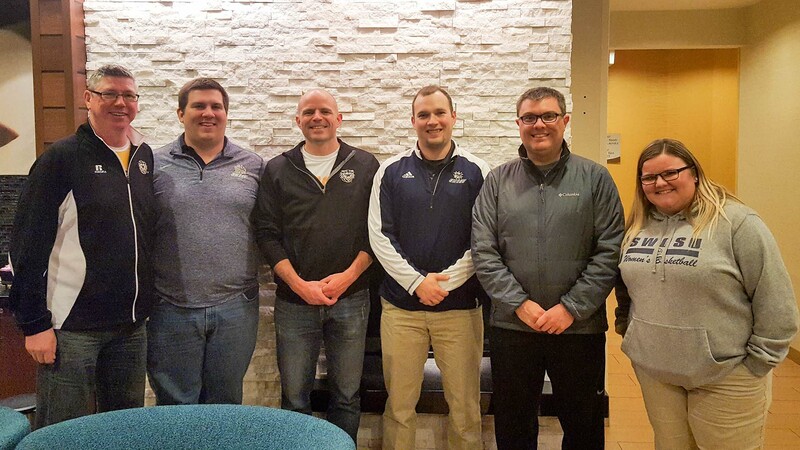 Cutline: Fort Hays State graduates involved with the athletic departments at two NCAA Division II schools playing against each other Friday in women’s basketball were, from left, Gerard Wellbrock, Mike Hammett, Dustin Armbruster, Doug Self, Ryan Prickett and Lacey Jones.